No star burned more ferociously than Judy Garland. And nobody witnessed Garland's fierce talent at closer range than Stevie Phillips. During the Mad Men era, Stevie Philips was a young woman muscling her way into the manscape of Manhattan's glittering office towers. After a stint as a secretary, she began working for Freddie Fields and David Begelman at Music Corporation of America (MCA) under the glare of legendary über-agent Lew Wasserman. When MCA blew apart, Fields and Begelman created Creative Management Associates (CMA), and Stevie went along. Fields convinced Garland to come on board, and Stevie became, as she puts it, "Garland's shadow," putting out fires-figurative and literal-in order to get her to the next concert in the next down-and-out town. Philips paints a portrait of Garland at the bitter end and although it was at times a nightmare, Philips says, "She became my teacher," showing her "how to" and "how not to" live. Stevie also represented Garland's fiercely talented daughter, Liza Minnelli, as well as Robert Redford, Paul Newman, Henry Fonda, George Roy Hill, Bob Fosse, Cat Stevens, and David Bowie. She produced both films and Broadway shows and counted her colleague, the legendary agent Sue Mengers, among her closest confidantes. 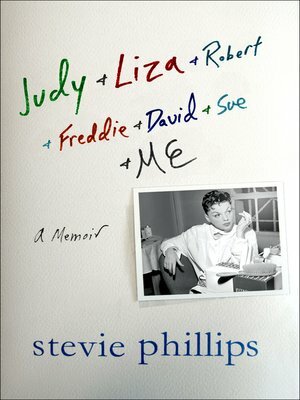 Now Stevie Phillips reveals all in Judy & Liza & Robert & Freddie & David & Sue & Me..., a tough-talking memoir by a woman who worked with some of the biggest names in show business. It's a helluva ride.